A few weeks ago, while I was waiting for the new GD soaps I saw this vegetable soap for sale and, although my favorite ones are tallow soaps, I decided to try it. And today, after having tried it for a few shaves, I decided to give you my impressions. Behind this company is Mohammad, an American artisan who, as many of you will know, despite having been in this world for a short time, has won a place on the podium of the best artisans with his own merits. And this is not a personal appreciation, it is a reality. Every time he take out a new soap he run out of stocks in a matter of hours. And it is not for less, has managed to make a qualitative leap in their products being closer to cosmetic products than simple shaving soaps. 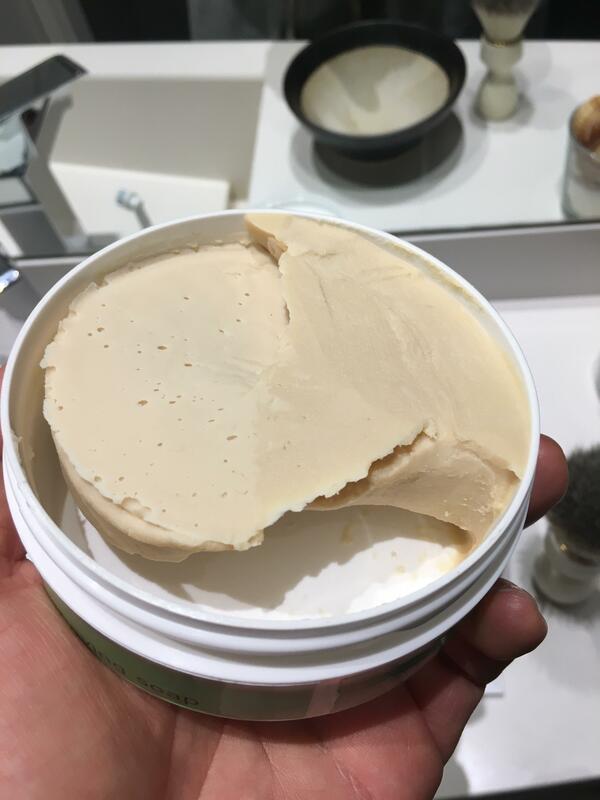 The packaging of this soap is the usual one used by American craftsmen, a plastic container with a diameter large enough to load directly from the container, although in this case it is not recommended to do so. I usually divide the containers of these soaps between those with very attractive stickers and those that are very simple. In this case we have no doubt, it is a simple sticker but with which we can already go to the idea that it will be a citrus scent. An interesting detail that is a clear example of the traditional method that is followed in these soaps is that when we open it we can see that since it was not in a horizontal position during curing, the soap has accumulated on one side. This in a soap with chain manufacturing would not have happened, so in a way it has its grace. 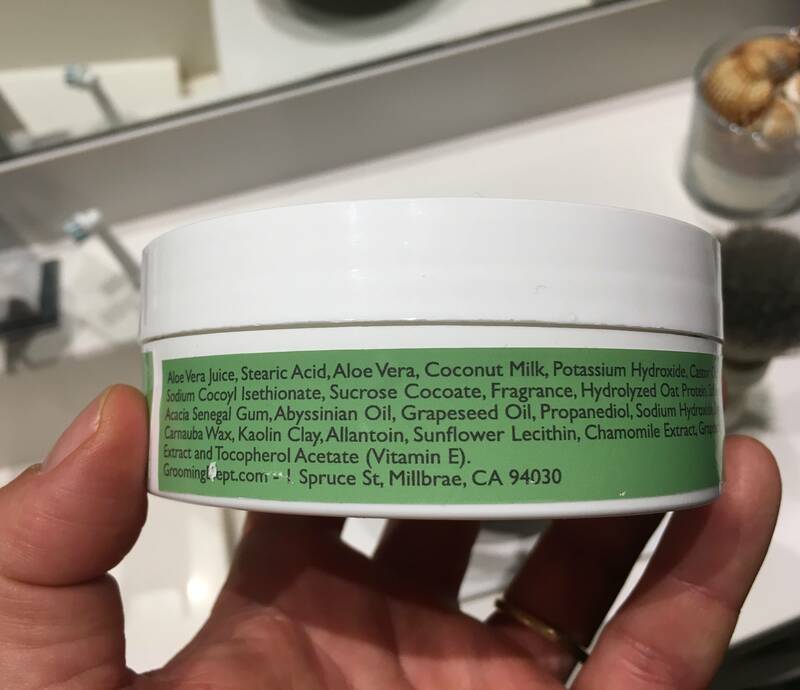 Aloe Vera Juice, Stearic Acid, Coconut Milk, Potassium Hydroxide, Castor Oil, Kokum Butter, Bubassu Oil, Shea Butter, Glycerine,Sodium Cocoyl Isethionete, Sucrose Cocoate, Fragrance, Hydrolyzed Oat Protein, Safflower Oil, Cupuacu Butter, Jojoba Oil, Flaxseed Oil, Acacia Senegal Gum, Abyssinian Oil, Grape Seed Oil, Propanediol, Sodium hydroxide, Sodium Lactate, Sodium Citrate, Xanthan Gum, Carnauba Wax, Kaolin Clay, Allantoin, Sunflower Lecithin, Chamomile Extract, Grapeseed Extract, Sea Buckthcorn Extract, Sacha Inchi Extract and Tocopheryl Acetate (Vitamin E). As I said at the beginning, a formulation closer to a premium cosmetic product than a shaving soap. They are soaps with the most usual amount of soap, 4.0 Oz (116 grs). Unlike older formulations of these soaps, this soap does not require much and with about 2 grams would be more than enough to give us a great shave and enjoy it. Therefore, we would last about 55-60 shaves. A detail that I would like to emphasize is that it is not recommended to directly load these soaps from the container. 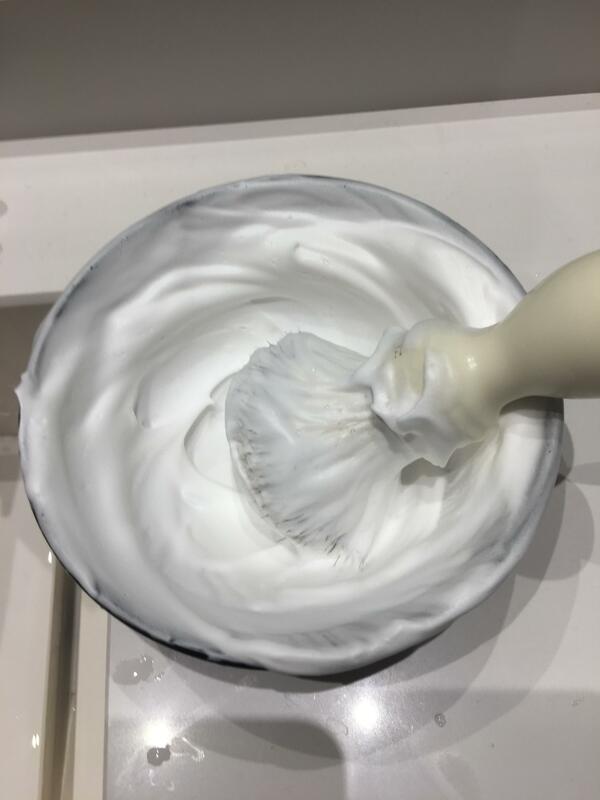 In order to make the most of the soap and that it lasts in perfect conditions longer, it is preferable to take out a small amount and use a bowl to froth. 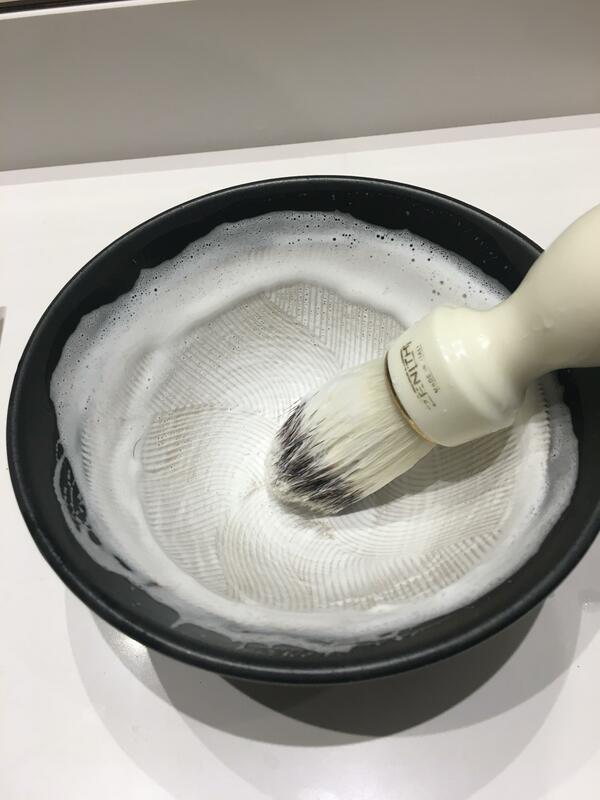 1 .- We will start by distributing all the soap in the most homogeneous way by the suribachi with the slightly damp brush. 2 .- We add water without fear. We always integrate it slowly with the soap and then stir with energy. This soap absorbs a lot of water, but as always it is preferable to add it little by little to obtain better results. 3.- We add a few more drops of water again. It is always a pleasant process to create the lather of the soaps, but in this case even more since I have the whole bathroom with an incredible perfume. 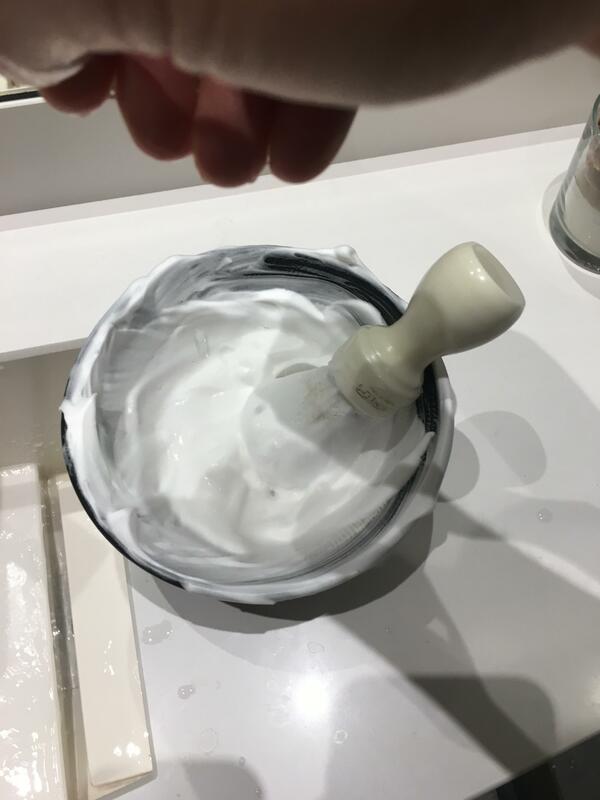 4.- And after adding water three times, and stirring it up with energy, we can say that we have a great lather ready to use. As you can see in the photo you can see that it has a body, that it is dense and abondant. It's a pity that you can not touch it or smell it because it's incredible. My experience tells me that vegetable soaps need less water than tallow soaps, however in this case this soap has admitted enough water during the whole process and that makes the probability that you get a bad lather is very low, because tolerates more water than you would normally add. This lather creates a film on the skin that causes the razor to pass safely over the whole beard. 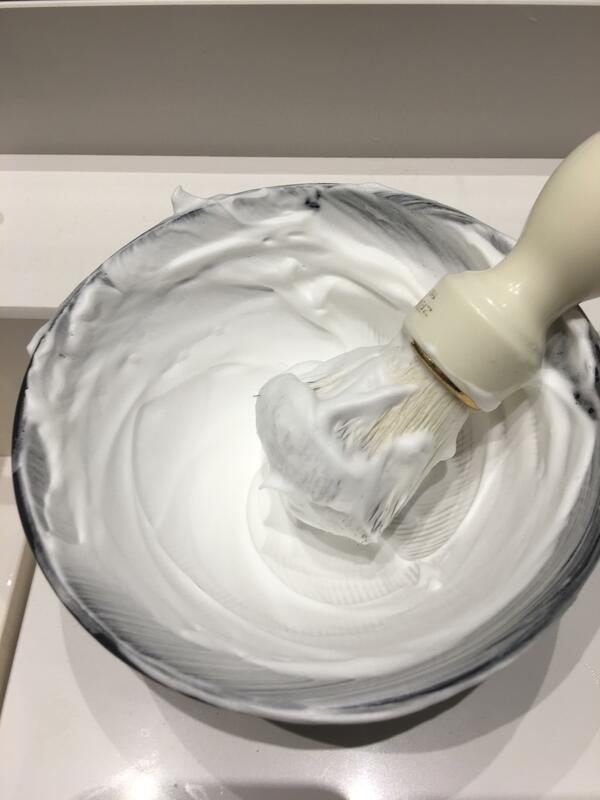 The fact that the formula contains so many emollient products makes the weakening of the hair extremely easy and that much less has to be done to achieve an extreme hurry. In slippage, and from my point of view, it would only be surpassed by formula 4.3 of Saponificio Varesino. At this point, this soap I think if it is not the best, yes it is on the podium. For me it is the soap that best leaves my skin with a lot of difference. Mohammad's formula is so careful that he gives two tips when you buy it, that you usually use it so that the skin serves as a "cosmetic treatment" (although it could also be to spend it quickly and buy another ) and that once finish shaving, apply with what you have left soap a lather of comfort and leave it on your skin the time it takes to clean and pick up the bathroom. After that time, you remove it with cold water and you should not dry with a towel. You must wait for the water, along with all the essential oils of the soap, to dry on your skin to make the most of the benefits of the soap. It's great I do it that way and I assure you that it is the best post I have had with a soap. It is a wonderful aroma to fresh cologne. In fact the name "Kölsnich" means colony in German. It has a fixation on the average skin, but during shaving it floods the bathroom with this pleasant aroma. Basically they are citrus aromas, bergamot and petitgrain. These soaps are expensive, if you buy overseas, buying more expensive, because the international shipping and import taxes are high. Considering the aforementioned factors (price and estimated number of shaves), for someone living in the USA the shaves will cost around $ 0.42 per shave. If you live in Europe, the price of shaving goes up to approximately $ 0.85 - $ 1.10. You will already see in my successive reviews of products, that I prefer to give several points of view and that each one draw their conclusions. If you are looking for a Premium product, you only settle for the best, or you love to try and collect soaps, without a doubt it is an essential purchase to have at least a vegetable soap and a tallow soap from this craftsman. But for all those that the soap is a mere procedure to pass the razor and is not the factor that most value the shaving, there are many soaps that fulfill their purpose for much less money. To me personally if it compensates me. I love classic shaving, especially with safety razor DE and what I enjoy the most with soaps and their foaming process. And these are the best. They are expensive (in Spain very expensive) so I have to choose well and buy few, but they are fantastic. The day I shave with them, it's a small luxury that I value and makes the day start with a big smile. , and Magnolia of earlier versions. All are great! Do yourself a favor and pick up one of the new Janus Vegan soaps. Wholly smokes!! Just flat incredible how it performs! Very nice review. 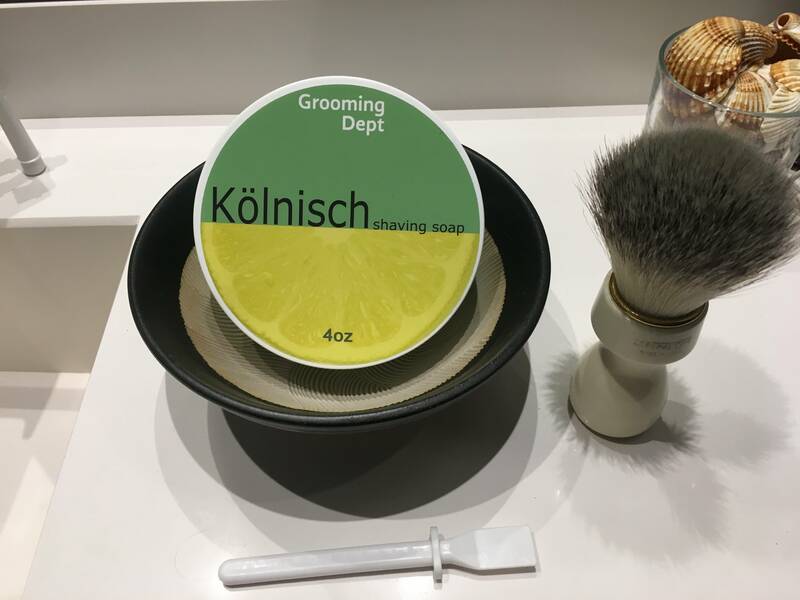 Kölnisch is my favorite soap scent of them all. I actually used it this morning. I have a backup tub in my closet for when my current tub runs out. I love how my bathroom smells after using this stuff. This must be one of the best reviews I've ever read, thank you for sharing. Mind if I ask how do you like that Zenith brush? Could you compare it to any other synthetics? 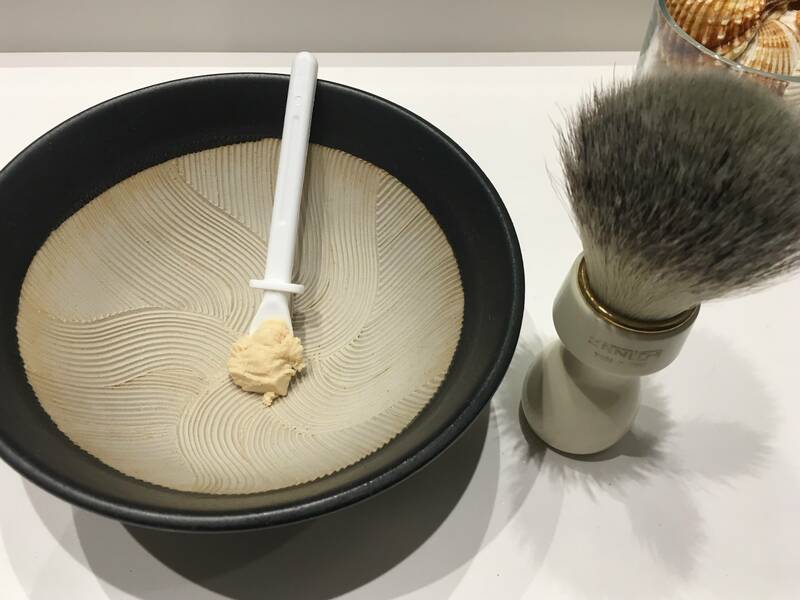 This Zenith brush is the one I usually use with the suribachi. It is a quite stiff synthetic brush and that makes the task much easier when scratching the soaps and evenly distributing the soap. 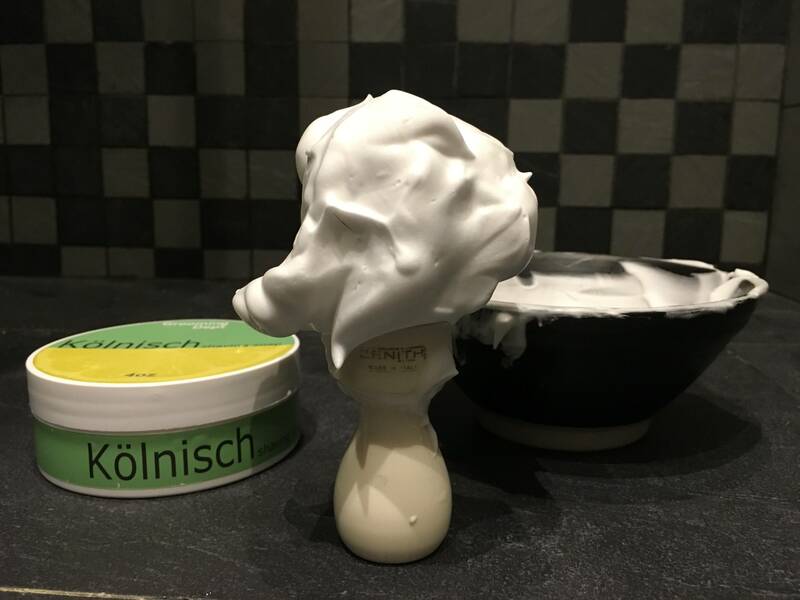 I do not recommend it to use it directly on the face, because the fibers are scarcely opened, however to use it with a bowl it is perfect, as well as having a barber handle is very comfortable. Thanks for the review. Just curious about how many shaves you are basing your cost per shave figure on? Like 60 or so? What an excellent review Luis_Garcia! That's more or less keto . With this "spoon" I usually take around 1,5-2grs of soap (0.05Oz - 0.07Oz), this soap has 4.0Oz of product so, I will spend this soap in 50-60 uses. The rest, is to divide the price between the number of future shaves that I will give with the soap. It is easy, however It is an approximation, each one of us has our habits and some of us spend more soap than necessary, which will make us last less and we will get a little more expensive everyday.